In the course of 2 years, my interest in nutrition has deepened passionately and I have researched 148 individual diets, and I have come to the conclusion that diets simply set us up to fail. Even the word “diet” makes me want to run for a snickers bar and leaves me feeling deprived! Change your mindset, set yourself up to succeed. Forget the word diet and set yourself a goal to just simply be healthy and see what happens as a result of that…I think you will be blown away with the ensuing results. I sure am! In November 2012 I was 94kg (possibly more – I had actually given up weighing myself!). Now in February 2014 (15 months on), I am 60kgs (I fluctuate between 59-61). So on average I have lost 34kgs, which actually isn’t that dramatic over a sustained period of time but I believe it will stay off as it wasn’t crash dieting. We are all looking for that elusive diet, but the simple fact of the matter is that we are all so diverse that what works for you may not work for me, there is a little problem of bio-individuality at play here; factors like age, ethnicity, anatomy, cell structures etc. Whilst my body reacts badly to red meat protein and dairy, yours may bloat with plant protein, so my big tip is to listen to YOUR body and look at what you are eating. If your diet contains a lot of refined foods and sugars and you feel tired, lousy and overweight then simply start experimenting…. Watch this space because over the next couple of days as I will be sharing with you what been working for me. I will be sharing my daily food tips, daily food log, what keeps me motivated and my lifestyle secrets on how I keep the weight off and energized! Let me start off by sharing my basic everyday tricks . . . . I cannot stress enough WATER, WATER, WATER….It is such a simple thing but the last thing we remember. Drink 2-3 litres alone without changing anything else and you will see a massive difference in your weight, skin, hair and mental clarity. Keep a food Diary – It’s so easy to “forget” the odd caramel slice, but sadly the belly and hips don’t!!! Keep an eye on your booze portions!!!! How “standard” is that drink you are pouring. I remember pouring a wine for my friend and me and a whole bottle had disappeared into these 2 amazing wine glasses…scary! Exercise – I feel like a hypocrite here, because it took me 10 months to actually do any, but I have friends in wheelchairs who do yoga from their chairs – Just a 10 minute walk will help to give you clarity of mind, it doesn’t have to be a marathon. 10,000 miles always starts with just a single step. Try and add some clean, green, enzyme and nutrient food to your daily regime. It has taken me a year to realize I am now 80% raw and plant based, but I began slowly just adding a simple juice daily and gradually “crowded” out the bad, processed stuff without even realizing it, so I lost all cravings and it was a gentle process. Don’t go all gung-ho, be kind to yourself. Don’t set yourself up to fail. For me the transition happened gradually and it was never about losing weight, I simply made a decision to get my body as healthy as possible to avoid having to take a cocktail of devastating drugs. I felt I had nothing else to lose. Little did I know that the gentle changes I made would lose me weight, which was a wonderful side effect! Buy organic produce for juicing. Yes it does cost a wee bit more but aren’t you worth it? Below is a good little tip for people who can’t afford to buy organic all the time. The ones on the left absolutely should be organic due to heavy pesticide use when farming. The ones on the right you can get away with being non organic. I’m mindful that that people may object and say organic is too expensive! But then what price do you put on your health? 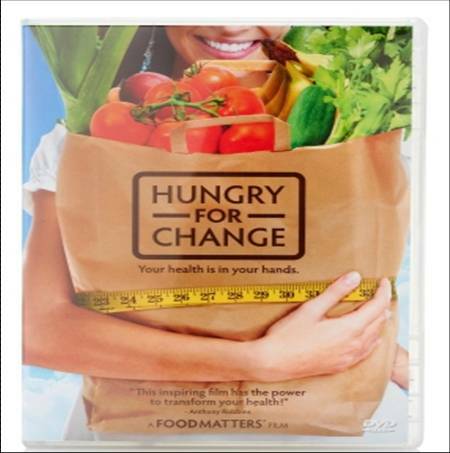 Get the DVD from TVSN website called “Hungry for Change” – Item no. 166583. This single DVD has changed my life forever and I advise all my wellness-coaching clients to watch this first and then come back to me if they are ready to change their lives. Do NOT watch this DVD if you do not want to change your life. It is impossible to watch it and not feel empowered to make changes. Follow amazing people like Jason Vale and Food Matters.tv on social media. You will get so much inspiration…seek out those who you desire to be like, bringing positive influences to your life. What I love about Jason is that he’s so darn down to earth and honest, but then he has come from exactly the same place as you and me when it comes to health and wanting to improve. If you are hungry or find you cannot ever eat breakfast then just have a weighless: Full of essential nutrients and vitamins and minerals. Nourish your body, don’t starve your body. Don’t feel self-indulgent or selfish for wanting to focus on YOU and your health. There is only one you. YOU are worth it! Your health is not a luxury. Thanks for your comment….I am unable to comment on Dr Bobs answer without hearing it in context, however I do know that shop bought commercial juice drinks are loaded with refined sugars and artificial flavorings and amount to empty calories. I wasn’t juicing for calories, I was juicing for nutrition . Here’s my understanding of “empty calories”; Empty calories are what foods with poor nutritional value are considered to have. For example, a candy bar is said to be an empty calorie food, as its calories are mostly from refined sugar and saturated fat. Refined sugar refers to highly processed white sugars, while saturated fat is mostly animal fats that remain solid at room temperature. A bowl of fresh fruits cut into pieces to form a salad may have as many or more calories than a candy bar, but offers the body a lot more nutrition since fruit is abundant in vitamins. Some foods and beverages may at first appear to be nutritious but have added ingredients that makes the choice high in empty calories. For instance, fruit punch or juice with added sugar may feature juices from real fruits, which give vitamins to the product. However, the sweet syrup added to it takes away from the drink’s nutritional value. Natural fruit juice without added sugar is a more nutrient-dense choice. Although steak and ground beef both come from a cow, their nutritional worth can be quite different. A small lean steak is a good source of iron and protein; it’s considered a healthy meat serving. But a fast-food hamburger made with fatty ground beef and sandwiched in a white bun with high-fat cheese and mayonnaise is considered as mostly empty calories. The fact that the meat also has protein and iron is overshadowed by the other unhealthy ingredients. So in juicing my leafy greens etc I’m getting the nutrition straight from the source, no interference from refined sugars or preservatives. If you also notice I was using the juices as supplements to my whey less and my meals. Getting my nutrients from raw living enzymes. And I favoured greens over fruits. On a final note I have to add I haven’t counted a single calorie in a year and have never felt hungry and have lost weight and returned to peak energy levels and health. I basically took the whey less programme subconsciously I guess, and put my spin on it! Instead of having snacks I had juices and it worked for me and introduced some amazing nutrient dense foods into my life that I otherwise have avoided, and that has been my message all along… Find what is right for you, we are all different and what worked for me may not necessarily work for you! If you want to feel alive – add living food to your diet. Thank you so much Nikki for taking the time to answer my question. I think Dr Bob actually referred to the cold press juicing as being a new “fad” too and he has juices on his list of things to avoid when on the Whey Less programme. It confused me as I had seen you on TVSN praising the benefits that cold press juicing had bought to you and it is very hard to disagree with something that is obviously working so well for you! manner, my mind switches to “calorie counting” mode and I can become a bit obsessive about it all. So it really is a struggle to find the middle ground between the two very unhealthy extremes. You look so healthy and full of life on TV and seem like a genuinely sincere and caring person. If I can do half as well as you have done, I will be happy. An added bonus of watching you on TVSN is your sense of humour – you really have helped me smile and laugh again recently over a very difficult holiday period. It was my first since my beautiful sister passed away in March last year – she was also my best friend, so it has been a truly awful year. I hope you know what a breath of fresh air you are on TV and TVSN are very lucky to have you. I thank-you once again for replying to my question. I will try some home made juices as part of my healthy eating plan but concentrate mainly on the leafy greens. I have already started on the Whey Less for breakfast and lunch and just love the chocolate flavour….really helping to satisfy my sweet tooth. Sorry to hear of your difficulties and your loss. Be kind to yourself. I believe our Primary Food starts with Self Love.